For as long as I can remember I've had a selection of Siamese cat calendars hanging somewhere in my house. There's something truly wonderful about the artwork of Suzanne Le Good, AmyLyn Bihrle and other artists who make their art available (very inexpensively!) through their beautiful calendars each year. Everyone has room for a Siamese calendar or two in their house! Don't they? Below, you'll find a selection of the ones I love. They're all very different but equally delightful. 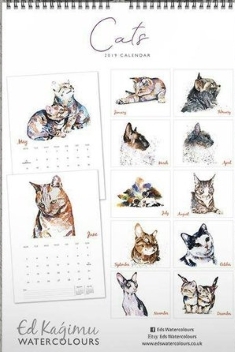 Some include other cats and cat breeds too - but all of the calendars are, in their own ways, very special and bring so much joy throughout the year. I've bought one of Suzanne Le Good's calendars every year for a number of years now, and one of the treats of the winter is opening a new one. It's something to look forward to in those cold and dark days - if, that is, you can stop yourself opening it until January 1st! Suzanne's calendars never disappoint and I can't bear to throw the old ones out so I now have quite a collection! At some stage I'm going to re-purpose them, and make a collage of all the wonderful cats. Suzanne makes a point of including new artwork every year so the designs are always fresh, and if you have enough patience not to look at any of the pages before turning over to the new month, they're always a lovely surprise and delight. Her artwork mixes whimsy with realism, style with wonderful use of color, and they're always very decorative. A real joy, as you can see from the tantalizing glimpses of 2019's images below. 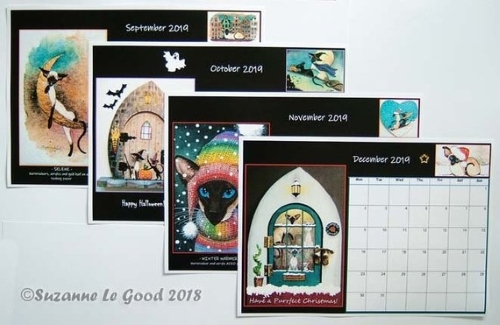 Suzanne's calendars are available in her Etsy shop, Suzanne's Gallery. And while you're there, I highly recommend browsing through some of her other work as her store is a treasure trove for every Siamese cat lover. I treat myself to the calendar in the run-up to the festive season and, as part of my preparations, usually buy a selection of her Christmas cards and one or two little gifts along the way too. Support for rescue centers around the world is very dear to my heart, first because so many Siamese cats seem to end up in them, and second, because my Bandit came from a rescue and without their work I would never have known him. Our next calendar has important role to play in helping to fund the work of the Siamese Cat Rescue Center (USA). 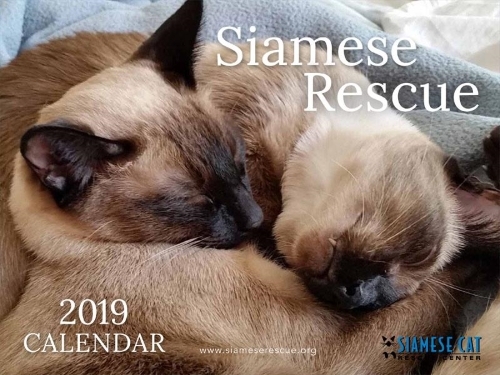 Filled with photos of Siamese cats and Siamese mixes rescued by the Center, together with their rescue histories, these calendars are exclusively available from the Rescue Center's Siamese Store along with many other goodies, and all in a very good cause. You might like to know that the Siamese Cat Rescue Center is celebrating its 21st anniversary this year, with over 25,000 cats rescued and rehomed. That's an awful lot of cats ... and an amazing achievement for an organization principally staffed by volunteers. 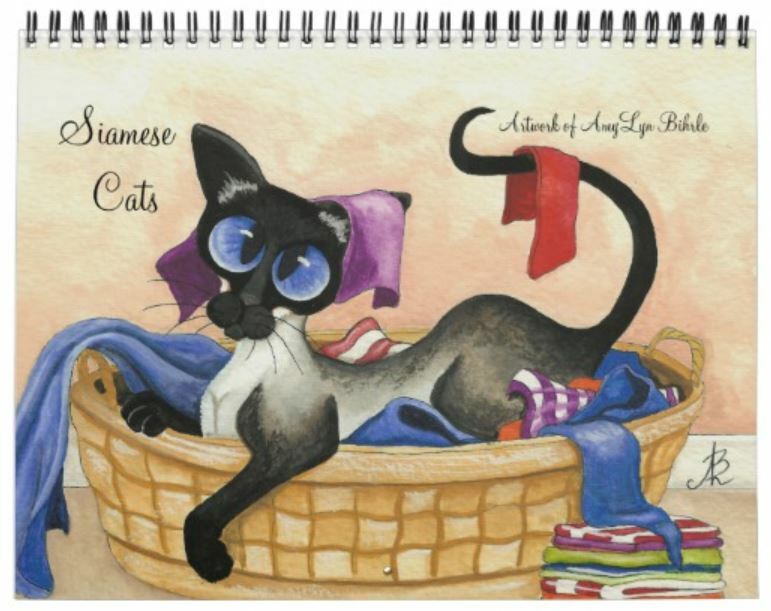 I love watercolor art and this calendar, with its collection of twelve beautiful watercolor paintings of Siamese cats, doesn't disappoint, with its sleeping, crouching, hunting, pensive adult cats and extra-cute kittens. 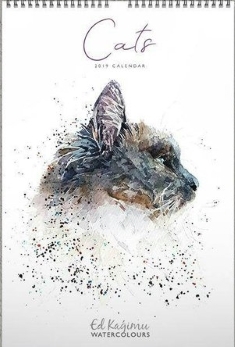 This calendar is available from print-on-demand merchant Zazzle, and their quality is excellent (I have one of AmyLyn Bihrle's calendars, below, also made by Zazzle). With gorgeous colors, and available in a range of sizes, you can find further details here. If you're a regular reader of Meezer Musings you may remember that AmyLyn Bihrle was featured artist in 2017, and her images often help to illustrate the newsletters. 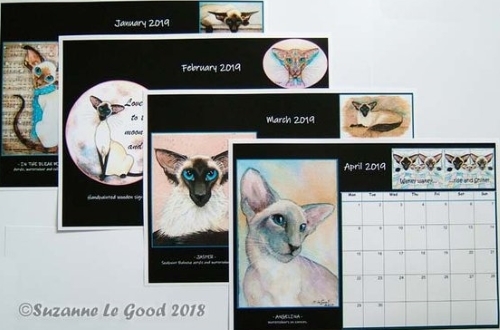 A range of all AmyLyn's art, including her beautiful big-blue-eyed Siamese cats can be found in her Etsy shop and when I contacted her to ask her for permission to feature her work she told me that she also produced a calendar, which I was of course keen to include here. 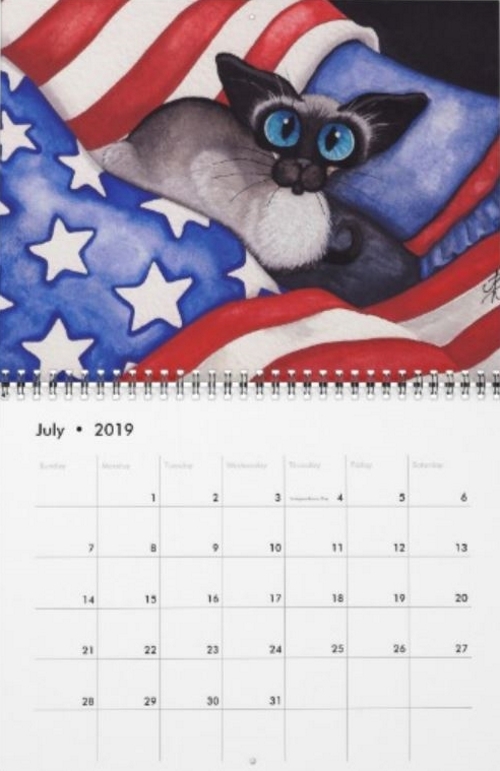 As you can see from 'July', below, every month includes a seasonally-appropriate picture of one of AmyLyn's adorable cats. 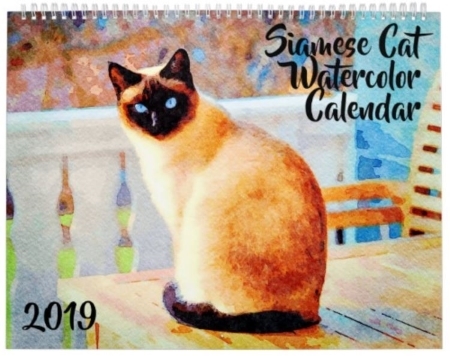 AmyLyn's Siamese cat calendars can be found in her Zazzle store where you can see further images of each month's artwork. What's not to love? Ed Kagimu is a British watercolor artist who paints animal portraits on commission. You can find Ed's calendar, together with some other wonderful animal artwork of his including beautiful cushions, in his store on Etsy, EdsWatercolours. 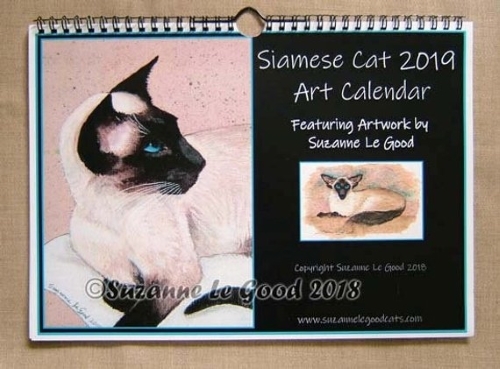 I hope you've enjoyed reading about the lovely Siamese cat calendars available for 2019 and might even be inspired to buy one! In doing so, you'll be using your love of Siamese cats to help both the artists and the cats, who will all very much appreciate your support.